Seventy years ago today, American forces dropped an atomic bomb on the Japanese city of Hiroshima. Three days later a second bomb would be dropped on the city of Nagasaki. Since records weren't reliable during the chaos after the destruction, conservative estimates are that over 250,000 human beings were killed by the affects of the initial bombings, resulting injuries, and the radiation sickness which followed. But, the actual death toll may have been much higher. Weeks after the attacks, on August 30, 1945, a Swiss doctor and delegate of the International Commitee of the Red Cross, whose major task during the war had been to oversee the observation of adherence to the Geneva Convention in POW camps and create neutrality so Red Cross ships could get supplies through, received photographic evidence and telegraphs revealing the horrific conditions in Hiroshima. Dr. Marcel Junod than organized a mission of aid and became the first foreign doctor to reach Hiroshima. He brought with him an American investigation task force, two Japanese doctors, and 15 tons of medical supplies. For five days, he visited every major hospital, distributed supplies, and personally gave medical care to the wounded. After the war, he continued his humanitarian work with UNICEF and the Red Cross. Later, he had to retire as a surgeon due to an illness which prevented him from standing for long periods of time. So, he dedicated himself to medical research and anesthesiology, which would allow him to continue to help people while sitting down. He treated patients literally until the end of his life. 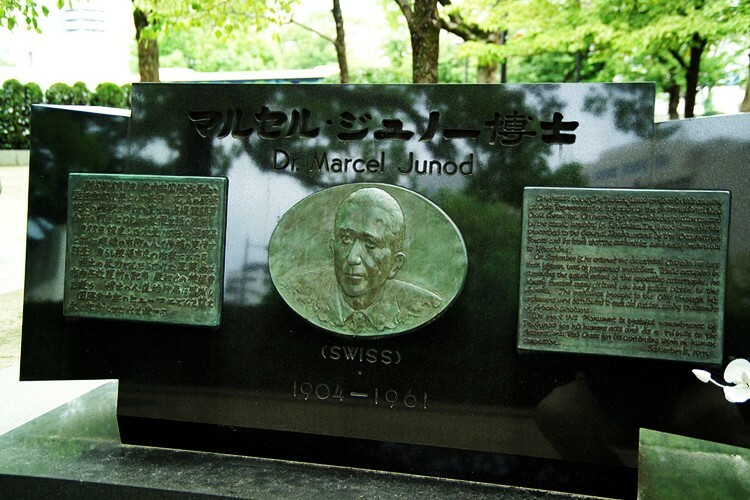 Working as an anesthesiologist, Dr. Marcel Junod died of a heart attack during an operation. Following his death in 1969, the International Committee of the Red Cross received over 3,000 letters of condolences from all over the world; and in 1979 a monument to Dr. Junod was inaugurated in the Hiroshima Peace Park, where each year on the anniversary of his death a meeting is held in front of the monument to commemorate his service to his fellow man. The last words etched on the back of this monument are from his book Warrior without Weapons, "Those who call for help are many. It is you they are calling." Aid is vital to helping people survive, not just in times of war or large-scale crisis, but following personal traumas and private illnesses as well. Whether with medical, financial, or emotional support, people need people. No one survives alone. We should never turn a blind eye, but keep our eyes and hearts open. We must be willing to help with our own hands. "It is you they are calling," are powerful words of truth. No one should stand by while another suffers, whether in front of them or half a world away. Empty empathy serves no one. Take action, even if only to reach out and hold someone's hand when they are hurting. Give of yourself to others in their times of need, for someday you may need help yourself.